Samurai, vikings and knights face off in For Honor, a game seemingly designed to end generations of playground 'who would win between...' arguments by pitting these iconic force against one another in measured, tactical close combat. You duel using stances that block directionally—left, right, and above. From these stances you launch attacks corresponding to that direction, so if you're in a high stance, with your sword held over your head, you can launch a powerful downward swoop toward the opponent's head. Battles are fundamentally about disrupting the enemy guard using quick stance-switches and block-breaking kicks. 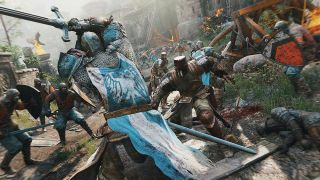 For Honor's announcement focused on team-multiplayer scraps that mix NPC chaff with player-controlled champions. This mix is mimicked in the single player missions. You have to outfox champions using the tactical guard-and-strike system, while lesser minions can be swept aside with generic swipes of your weapon. In these moments For Honor feels like a proper current-gen Dynasty Warriors—a game I dearly want. This mix of combatants makes for a good spectacle, and it means you won't have to spend hours in a courtyard individually duelling down every grunt in the place. However, this is very awkward when the game frequently asks you to press through a throng to reach an objective marker. When a champion approaches you slow down and become locked into tactical duelling mode. To escape and make it to the objective I ended up circling around individual samurai so I could dodge backwards, become unstuck and run away. Such brave tactics are unlikely to have graced the battlefields of old. Duelling champions is a fiddly process, especially when you're required to switch focus and take out generic minions between exchanges. There is a stop-start rhythm to combat that damages the integrity of For Honor's otherwise beautifully modeled battle scenes. These odd moments are somewhat offset by For Honor's production values. The heroes have a satisfying sense of weight and power. The weathered armour glints pleasingly in torchlight, cloth sags and flaps realistically and the rain. For Honor's world feels grimy and rough-hewn. The developers' enthusiasm for armoured warriors and swordfighting is evident in the detailed battlefields and the satisfying steel-on-leather impact sounds. I have a feeling that For Honor's detailed portrayal of cool warriors with swords will make up for its limitations. As I chopped down samurai and dodged a champion's sneaky spinning attack I found myself hoping for a series of For Honor games. The fantasy is great, and with some refinement, I'd love to see Ubisoft Montreal bringing more warrior archetypes to life in the coming years.